We didn’t review Mordheim: City of the Damned at DDNet, but it’s a really good tactics strategy game set in one of Games Workshop’s beloved franchises (Games Workshop being the people behind the Warhammer tabletop games). Now the developer of Mordheim is back with another Games Workshop license, and we’re looking forward to this a great deal already. Necromunda is basically the same thing as Mordheim, but where Mordheim takes place in fantasy environments, Necromunda takes place in a distant future — think Mad Max or Fist of the North Star. Gangs battle one another over territory and scraps, and you’ll get to play as one of those gangs. You’ll be able to build your gang up by recruiting fighters, but beware: injuries and deaths to your fighters is permanent. You’ll get grim, tactical, turn-based action out of this one, and if it’s half as good as Mordheim was, it’ll be something special indeed. No release date at this stage, but we’re looking at PlayStation 4, Xbox One, and PC. Sadly, no Switch. This kind of game would be perfect on Switch. It seems like the game world had focused a spotlight on the Switch and won’t look away — but Nintendo is not included in that, as its next Nintendo Direct promises news on 3DS titles. The only confirmed game that will be showcased Mario Tennis Aces, which is unfortunate as it is a Switch title. What could be on the docket for the 3DS? Another peek at Detective Pokemon, which is releasing worldwide later this month? More Picross? I’d love a great new Picross title for the 3DS. 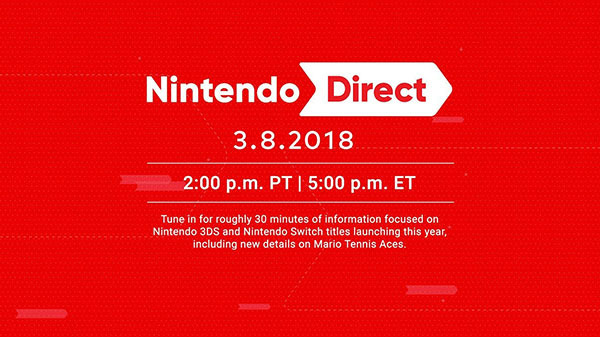 The Direct begins at 5 p.m. EST on March 8. In North America, head here. Japan? You’ll want to go here. And Europe, you don’t have a YouTube feed yet but the Nintendo website will surely direct you to the right place at the time! The Swords of Ditto looks pretty cute, and lands on April 24! Billing itself as a “compact action RPG” and being published by the indie workhorse, Devolver Digital, The Swords of Ditto is shaping up to be a charming, amusing, clever little game indeed. Promising plenty of characters, each with their own stories, this game also includes a friendly co-op mode, designed to help younger or less experienced players get through the game. And when you’re talking about a game with weaponry including a vinyl record, a giant foot from the heavens, and a magic golf club, you just know that this game is aiming to tickle everyone’s funny bones, and not just the RPG faithful. Devolver rarely let us down, and this one in particular is shaping up to be something special. The game is set to release on PlayStation 4 and PC on April 24. In the game, you control both the girl and the golem. The golem will evolve through the game, which allows the team to solve more puzzles. Levels range from deep caverns to windswept turrets. Golem, by Longbow Games, is coming to PC this spring (autumn if you’re down under! ).